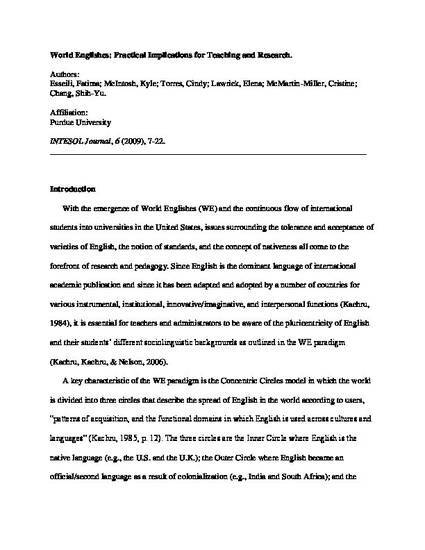 With the emergence of World Englishes (WE) and the continuous flow of international students into universities in the United States, issues surrounding the tolerance and acceptance of varieties of English, the notion of standards, and the concept of nativeness all come to the forefront of research and pedagogy. Since English is the dominant language of international academic publication and since it has been adapted and adopted by a number of countries for various instrumental, institutional, innovative/imaginative, and interpersonal functions (Kachru, 1984), it is essential for teachers and administrators to be aware of the pluricentricity of English and their students’ different sociolinguistic backgrounds as outlined in the WE paradigm (Kachru, Kachru, & Nelson, 2006). A key characteristic of the WE paradigm is the Concentric Circles model in which the world is divided into three circles that describe the spread of English in the world according to users, “patterns of acquisition, and the functional domains in which English is used across cultures and languages” (Kachru, 1985, p. 12). The three circles are the Inner Circle where English is the native language (e.g., the U.S. and the U.K.); the Outer Circle where English became an official/second language as a result of colonialization (e.g., India and South Africa); and the Expanding Circle where English is taught as a foreign language (e.g., France, Russia, and China). Another element of WE research includes the issues of nativeness and standards. “Who is a native speaker?” and “which standard should we teach?” are two questions that have been debated for the past 60 years. This paper addresses these issues in the classroom and beyond. It contextualizes and identifies the problem with English as a Second Language (ESL) composition classes in the Inner Circle context, specifically the U.S., and examines several methods for incorporating a WE perspective into an ESL composition program. It also challenges English language teacher requirements and an international publication culture that follows Inner Circle standards. Document available for download is the authors' accepted manuscript, provided in compliance with the publisher's policy on self-archiving. Permission documentation is on file.